With the new legislation pertaining to security electric fencing now in operation, many housing and industrial estates are faced with the prospect of having to erect expensive barrier fences in front of their existing high-powered, monitored, electric security fences. 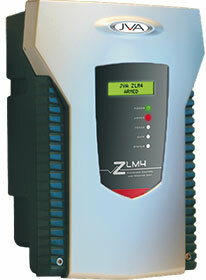 The good news is there is no need to panic, as the new JVA ZLM4 low-voltage monitor solves this dilemma. By simply attaching a JVA ZLM4 to the portion of electric fence below 1,5 metres and monitoring this portion with low voltage, which is quite legal, the monitoring capability of the fence is retained. Admittedly one will lose the deterrent high-voltage shock but the fence will still retain its aggressive appearance and its monitoring capabilities. What is more, the JVA ZLM4 is a four-sector monitor, so with a bit of simple wiring reconfiguration the sectorisation of one’s fence can be increased, thereby reducing reaction time. These JVA ZLM4 units have also been installed on fences that meet the legal requirements, but which during the day contain the general public within the secured area, e.g. schools, senior citizen complexes, sporting facilities and carparks. These facilities are now running their fences on low power during the day and then stepping them back up to high power at night when no one is present, giving them the best of both worlds.